It sounds like a natural: Duncan Jones, director of the ingenious science fiction mystery Moon, goes back to the future with a throwback plot that could have been pilfered from a 1940s B-movie noir. Alexander Skarsgård (True Blood) is the gentle, mute bartender Leo, an innocent in crisp, buttoned-up shirts who works in an upscale bar catering to the rich, corrupt, and criminal. His blue-haired waitress girlfriend Naadirah (Seyneb Saleh) is a born hustler with a shadowy past brewing up some kind of scheme. When she disappears, he hits the mean streets of 2058 Berlin in search of his tarnished angel, who may or may not have played him for a patsy. It's Raymond Chandler-meets-Blade Runner as cinematic fashion statement. Skarsgård is perfectly fine as the puppyish Leo who turns bulldog whenever Naadirah is threatened or even dissed, but Jones seems more interested in the production design, which is gorgeous if generic (it seems random, lacking the sense of future history of its inspiration), and a pair of black-market surgeons on call to the local mob boss. Their odyssey is, if anything, even more aimless, but Paul Rudd and Justin Theroux have fun channeling Elliott Gould and Donald Sutherland from Robert Altman's M*A*S*H, right down to Rudd's Trapper John mustache and their mutual affection for aloha shirts. Rudd's chemistry with Theroux and the ferocity he brings to his hair-trigger temper help distract from the unsettling (and ultimately unsatisfying) side trip involving pedophilia. While their presence is a welcome distraction, their purpose isn't even made clear until the third act. Jones developed the script 15 years ago, planning it as the follow-up to his 2009 debut Moon (there's an inspired call-out to his breakout film playing in the background of one scene), but couldn't secure financing for his vision until Netflix stepped in with the budget and a promise of final cut. A dream situation for Jones, it would seem, but the results of the Netflix formula—essentially throwing money at genre films that tick off certain demographic boxes—have been mixed at best. For every Okja, there's a half-dozen misfires like Bright, The Cloverfield Paradox, and now Mute. A producer might have helped shore up the meandering script, or at least convinced Jones to shave it down from a dawdling 123 minutes to something better suited to its frankly serviceable tour through a tawdry neon future. 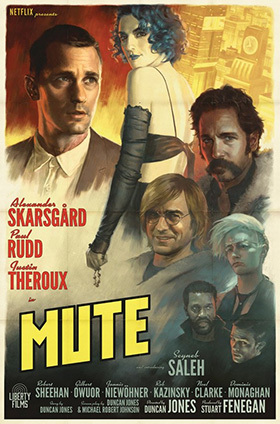 Mute should be classic noir-meets- future shock, with the same hustle, hopelessness, and predatory criminal culture of a 1940s urban crime thriller dropped into the eternal night of an ecologically damaged world, but the plot is utilitarian at best and the characters amble through their tech noir playground without any urgency. Slow and listless, lacking tension or a sense of danger, it's a pastiche with aspirations to being a movie that ends up a very expensive pageant.